“May the new president be a great leader who can make democracy take root in this country and bring peace and prosperity to the Korean people,” Archbishop Kim said in his statement. 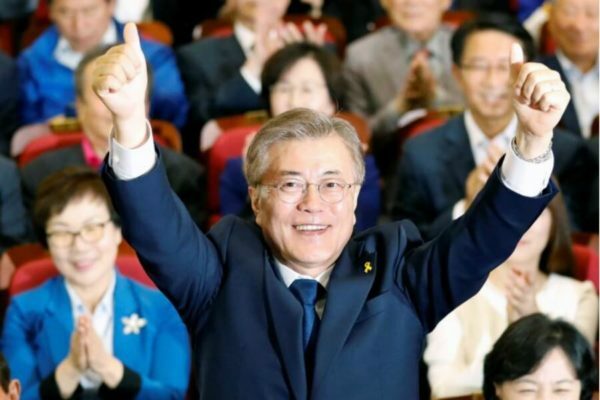 Moon, a Catholic and member of South Korea’s Democratic Party, won the May 9 election with 41 percent of the vote among a slate of 13 candidates. The son of North Korean immigrants had remained in the front-runner position since former President Park Geun-hye’s ouster in early March. “I hope that the new president will lead this nation to be one where, in the spirit of the constitution, the vulnerable and disadvantaged in the society can be treated with human dignity and respect,” said Archbishop Kim. Moon, 64, was buoyed by the growing dissatisfaction of ordinary citizens whose anger over corruption was years in the making under Park. From late 2016 to early 2017, tens of thousands of South Koreans filled the streets of Seoul every week calling for Park’s removal. A bitter division took root as the rallies were met with counterprotests in support of Park, whom investigators had linked to a corruption scandal that involved bribing top officials of major Korean corporations, including Samsung. Park is accused to taking part in a bribery scheme with colluding top executives in exchange for policies that gave them majority control of their companies. Her longtime friend and associate, Choi Soon-sil, a private citizen whom investigators say was given access to state secrets, allegedly brokered the deals. Park, Choi and some executives, all currently detained and awaiting trial, have denied any wrongdoing. Moon ran on a promise to see Park’s trial through, while the top conservative- and moderate-leaning candidates leaned toward pardoning her. He also declared he would be a “president for the people” who could reunite the country after the divisive protests. Moon is also widely seen as a South Korean leader who could bring better, less hardline relations with North Korea. Father Kim, 42, told Catholic News Service that expectations are high for Moon to solve the problem of economic inequality, with a high number of unemployed yet highly educated young people and workers being exploited and underpaid at the expense of corporate gain. Moon, a former human rights attorney, narrowly lost to Park in the 2012 elections. From 2003 to 2008, he was chief of staff to former President Roh Moo-hyun, whose administration sought more harmonious relations with the North. As a student in the 1970s he went to jail twice for protesting against then-dictator Park Chung-hee, the father of Park Geun-hye. Park’s supporters, mostly older Koreans with memories of South Korea’s post Korean-war rapid industrialization and swift march to prosperity, favored the conservative and moderate candidates in this election.